Earlier this week a YouTuber by the name of Francis Darracott found a GoPro camera while fishing off the coast of England near Poole - after almost a year in the water (judging by the timestamps on the video), the camera's waterproof housing had failed, but the recorded video was still retrievable. All of which means we have around three minutes of rather interesting ocean floor footage courtesy of whomever it was who lost the camera in the first place. As you might expect, not a lot happens for a while, but the appearance of the crab is a definite highlight. It just goes to show the stamina of some of the modern day tech we carry around every day, even if the GoPro itself didn't survive the 11 months underwater. Now Darracott wants to find the original owner of the camera to return the footage (there's a hint in the video comments that the right person has been located). 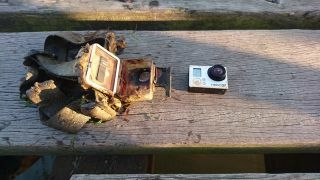 Even if your action camera has disappeared beneath the waves, don't despair - you might one day get it back. However, if this turns out to be a viral marketing campaign run by an advertising firm, feel free to start despairing immediately.